Editor/Author Caulkins, D. Douglas and Jordan, Ann T.
The first comprehensive guide to anthropological studies of complex organizations. Offers the first comprehensive reference to the anthropological study of complex organizations. 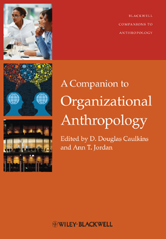 Details how organizational theory and research in business has adopted anthropology's key concept of culture, inspiring new insights into organizational dynamics and development. Highlights pioneering theoretical perspectives ranging from symbolic and semiotic approaches to neuroscientific frameworks for studying contemporary organizations. Addresses the comparative and cross-cultural dimensions of multinational corporations and of non-governmental organizations working in the globalizing economy. Topics covered include organizational dynamics, entrepreneurship, innovation, social networks, cognitive models and team building, organizational dysfunctions, global networked organizations, NGOs, unions, virtual communities, corporate culture and social responsibility. Presents a body of work that reflects the breadth and depth of the field of organizational anthropology and makes the case for the importance of the field in the anthropology of the twenty-first century.